1995-W Proof Silver American Eagle PF-69 NGC - SKU #25037. 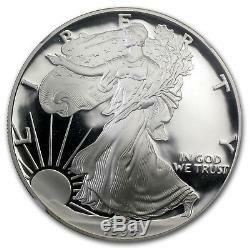 With a mintage of only 30,125 coins, the 1995-W is far and away the absolute key to the Proof Silver Eagle series. This near-perfect example, graded PF-69 and encapsulated by NGC, is sure to be the highlight of any Proof Silver Eagle set! Key Date with a mintage of only 30,125 coins. NGC encapsulation protects the proof 69 condition of the coin. Mirrorlike Proof finish adds further beauty with an impressive shine. Weinman's design showing Lady Liberty draped in an American flag, walking gracefully as the sun rises over a ridge. 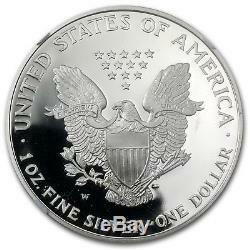 Reverse: A heraldic eagle is shown below 13 small stars, representing the original colonies. Sovereign coin backed by the U. One of the most popular designs in American coinage, the Silver Eagle combines beauty with Silver bullion appeal. 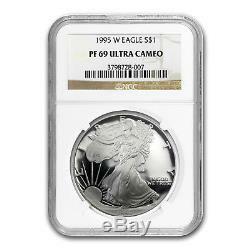 Complete your collection with this 1995-W Proof Silver Eagle today! Each package is fully insured. Your assistance speeds up the investigation and the sooner we complete it, the sooner we can resolve the missing order. If we determine the package is lost or damaged, we file a claim. Failure to fully cooperate will jeopardize coverage that may be provided to you. For approved exchanges, you must follow all instructions provided by Customer Service, including carefully packaging the Product. Prices Q: How often are prices updated? Our listings remain live while pricing updates so you don't have to worry about listings being removed and reposted. Orders Q: Is there a minimum order amount? Orders of all dollar amounts are welcome. Q: Can I change my order once it's placed? A: Processing begins immediately upon completion therefore changes cannot be accepted. Q: Can I cancel my order? A: Once your order is completed it cannot be cancelled. Please be certain of your order before finalizing. Q: Is my package insured while in transit? Additionally, if a package is signed for by the apartment/complex building management, we do not assume responsibility. Q: What do I do when my package appears to be lost? There are no added commissions. Back Ordered Items Supply and demand problems occasionally occur in our business. From time to time, we have more buyers than sellers. If your Order(s) is cancelled, you agree you have full responsibility and liability to APMEX for any Market Loss. Risks All investments involve risk; Coins and Bullion are no exception. The value of a Bullion Coin e. American Eagles or Canadian Maple Leafs is affected by many economic factors, including the current market price of Bullion, the perceived scarcity of the Coins and other factors. Some of these factors include the quality, and current demand and general market sentiment. Therefore, because both Bullion and Coins can go down in price as well as up, investing in them may not be suitable for everyone. The value of any Bullion item is generally determined by current spot price of the underlying Precious Metal and by the supply and demand for these particular items. These prices will fluctuate throughout the day while the Precious Metals market is open. If you are considering purchasing Precious Metals as an investment, you should assess the stability of the current market and contact your financial advisor for all advice. Definitions The following terms have the following meanings in these T&C: 1. The term "APMEX" means APMEX, Inc. The term "Bullion" is used to describe (1) Gold, Silver, Platinum or Palladium Coin(s) which closely follow spot prices and have little or no Numismatic value (such as restrikes); and (2) the form in which metal is shaped such as bars, ingots or wafers. The term "Coin(s)" means a stamped piece of metal of a known weight and fineness issued for commerce by a sovereign government. APMEX may amend these T&C at any time by posting the amended terms on the website, and such amendments shall become effective immediately. If you become aware that you may be required to make any disclosure of such information, including, without limitation, as a result of the receipt of a subpoena or other compulsory process, you shall promptly notify, in writing, APMEX and you shall cooperate, in good faith, with APMEX in obtaining a protective order or other appropriate relief, if any, with respect to such disclosure. The item "1995-W Proof Silver American Eagle PF-69 NGC SKU #25037" is in sale since Thursday, October 19, 2017. This item is in the category "Coins & Paper Money\Bullion\Gold\Other Gold Bullion".